"A Bayesian Stochastic-Blockmodel-based Approach for Mapping Epileptic Brain Networks"
The human brain is a dynamic system consisting of many consistently interacting regions. The brain regions and the influences exerted by each region over another, called directional connectivity, form a directional network. We study normal and abnormal directional brain networks of epileptic patients using their intracranial EEG (iEEG) data, which are multivariate time series recordings of many small brain regions. We propose a high-dimensional state-space multivariate autoregression model (SSMAR) for iEEG data. To characterize brain networks with a commonly reported cluster structure, we use a stochastic-block-model-motivated prior for possible network patterns in the SSMAR. 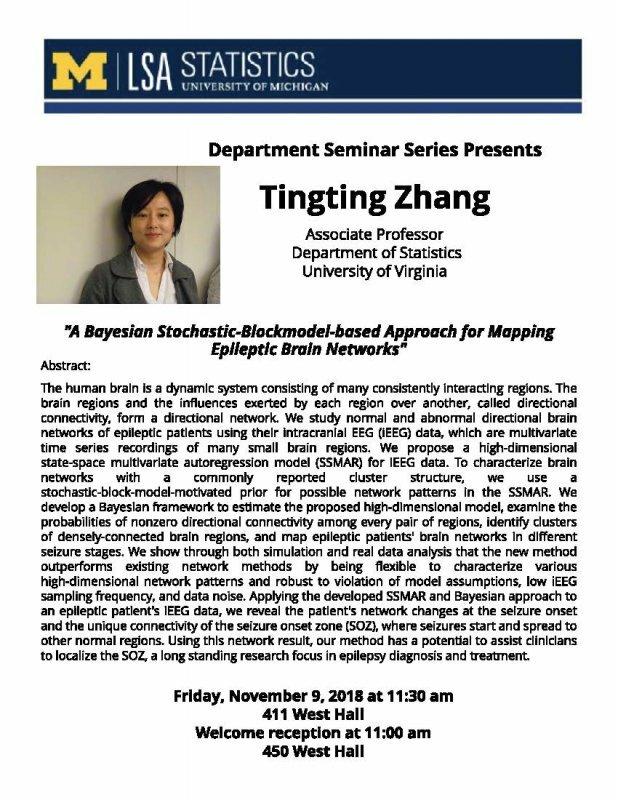 We develop a Bayesian framework to estimate the proposed high-dimensional model, examine the probabilities of nonzero directional connectivity among every pair of regions, identify clusters of densely-connected brain regions, and map epileptic patients' brain networks in different seizure stages. We show through both simulation and real data analysis that the new method outperforms existing network methods by being flexible to characterize various high-dimensional network patterns and robust to violation of model assumptions, low iEEG sampling frequency, and data noise. Applying the developed SSMAR and Bayesian approach to an epileptic patient's iEEG data, we reveal the patient's network changes at the seizure onset and the unique connectivity of the seizure onset zone (SOZ), where seizures start and spread to other normal regions. Using this network result, our method has a potential to assist clinicians to localize the SOZ, a long standing research focus in epilepsy diagnosis and treatment.